I last wrote about lovely Greek Easter family traditions and cooking sessions with my yiayias. Honest, good clean fun. Which is precisely why I’m now compelled to write about something down and dirty. To keep the balance. Today it’s all about outrageous, positively indecent (and calorie-defying) drinking food. 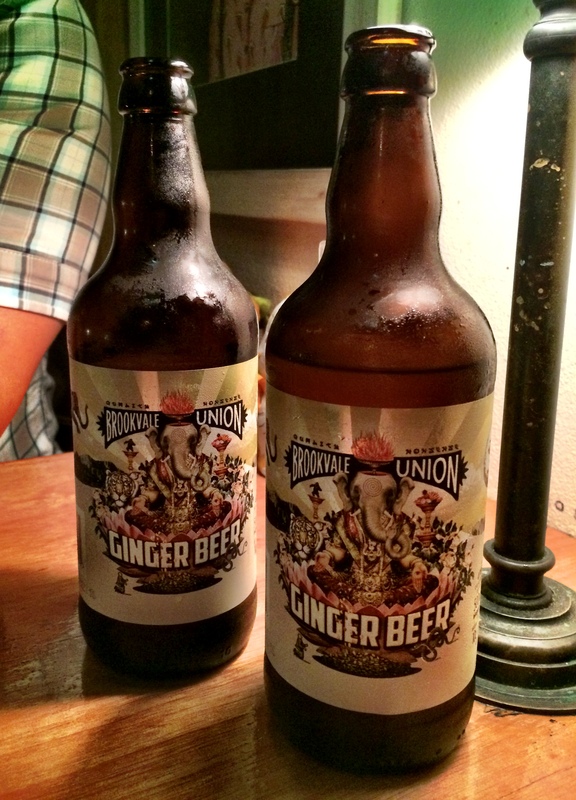 This idea came to me recently while I was drinking (alcoholic) ginger beer with a Canadian friend in a Canadian bar. There was only one thing to order in that situation. 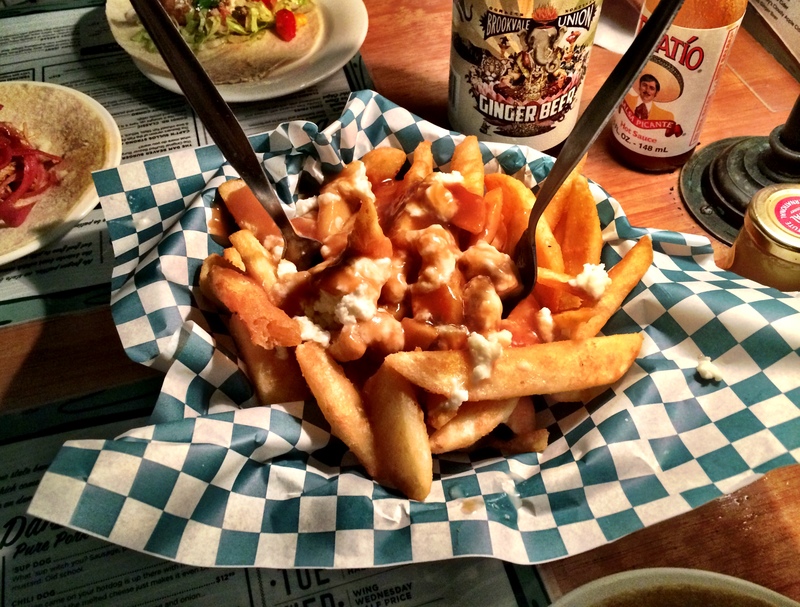 If you think poutine sounds French, that’s because it is – or at least it hails from French speaking Quebec. Chunky fries are topped with brown gravy and cheese curds so the whole thing is a greasy, salty, cheesy mess. A pretty tasty mess to be fair. According to my sidekick Ving, this was not poutine in its true form – partly because we just don’t make cheese curds in the same way the Canadians do. But he felt the sentiment was there. Apparently McDonald’s does a version in Canada – I’m not entirely confident about how that might taste. Poutine is pretty closely related to the cheesy chips that you see on pub menus far and wide throughout the UK. My favourite was a version I came across in Tresco (while snacking on scotch eggs naturally). 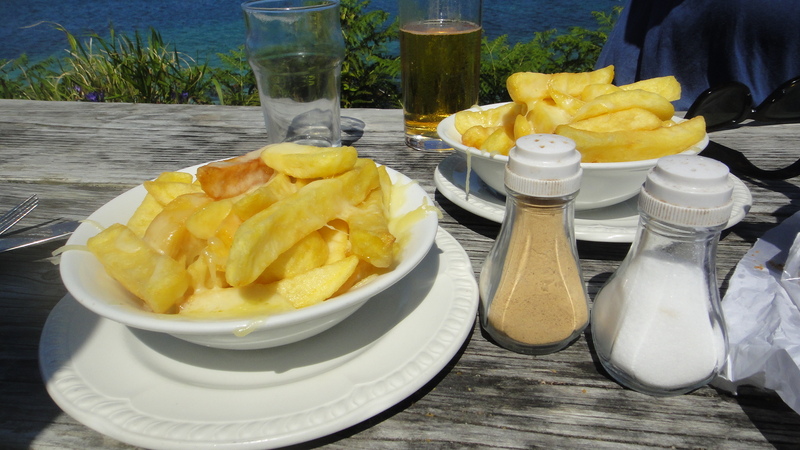 Good old fashioned chips are drowned with melted cheese so there’s nothing sophisticated going on there but they certainly go down well when you’re drinking copious amounts of local cider. 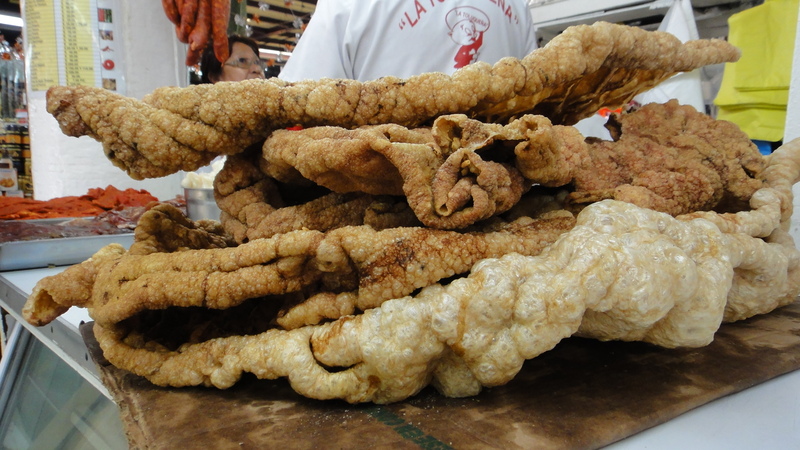 While we’re on the topic of fried foods, it doesn’t get much more debaucherous that chicharrónes or fried pork rinds. That’s where they take something already extremely fatty and proceed to deep fry it to really amp up the fat factor. Sounds like something Homer Simpson would eat. They’re impossible to miss in Mexico. At every turn there is a street cart piled high with big slabs of chicharrónes. They are sold by the bag for casual munching and are also added to tacos for crunch. Perhaps they inspired the bacon bit? I had a guilt trip just by looking at these but admittedly the taste is quite extraordinary. They pack a salty punch and simply melt in your mouth. Good luck stopping at one. 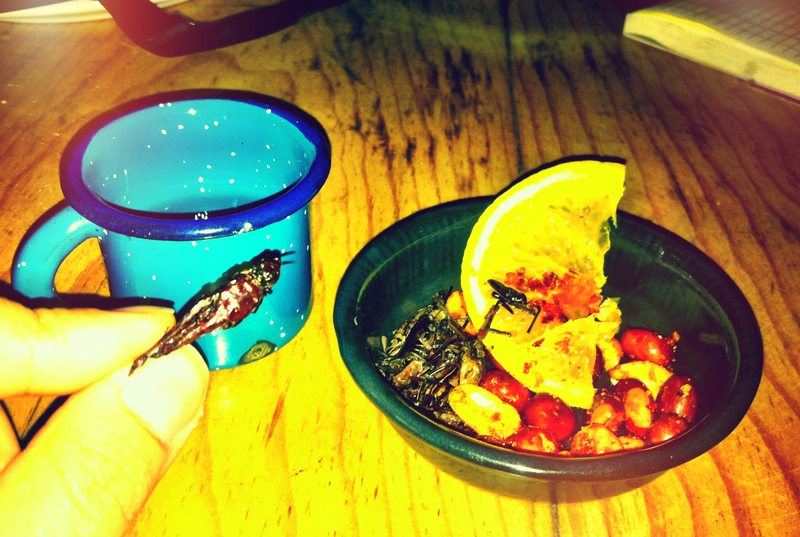 Crunchy grasshopper with your mezcal shot? The other crazy bar food I encountered in Mexico were chapulines, or fried grasshoppers. I’d heard the buzz about insects; the fact they’re full of protein, sustainable to produce, and one day we’ll all be eating them without thinking twice. Regardless of all this, it was still a small leap of faith to put that first one in my mouth. The mezcal I was drinking at the time was so strong though, that I probably would have eaten anything to try and temper the fire. 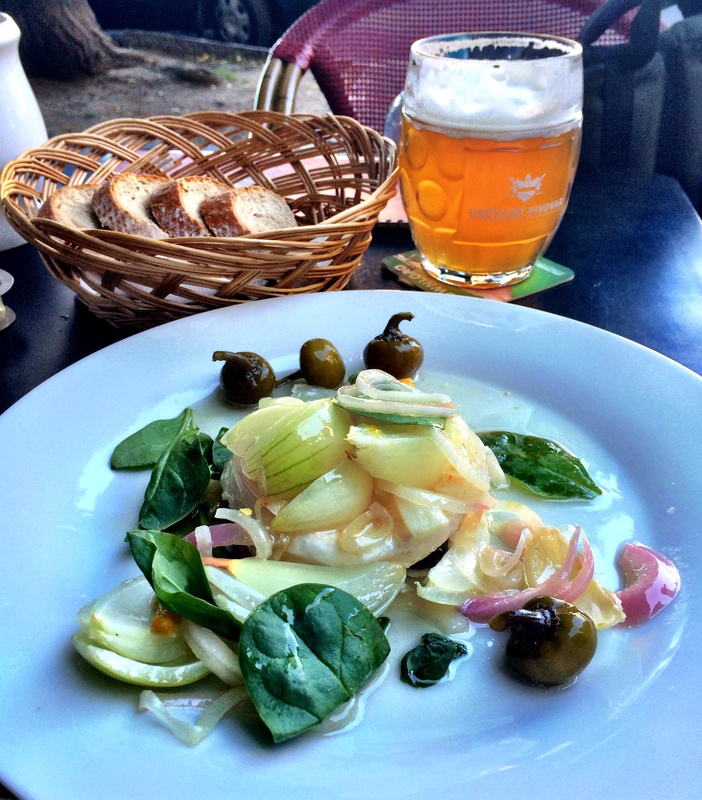 In my travels last year, I came across a drinking snack in Prague so ridiculous that I didn’t believe my friend Nick when he told me about it. And not just because it’s not fried. 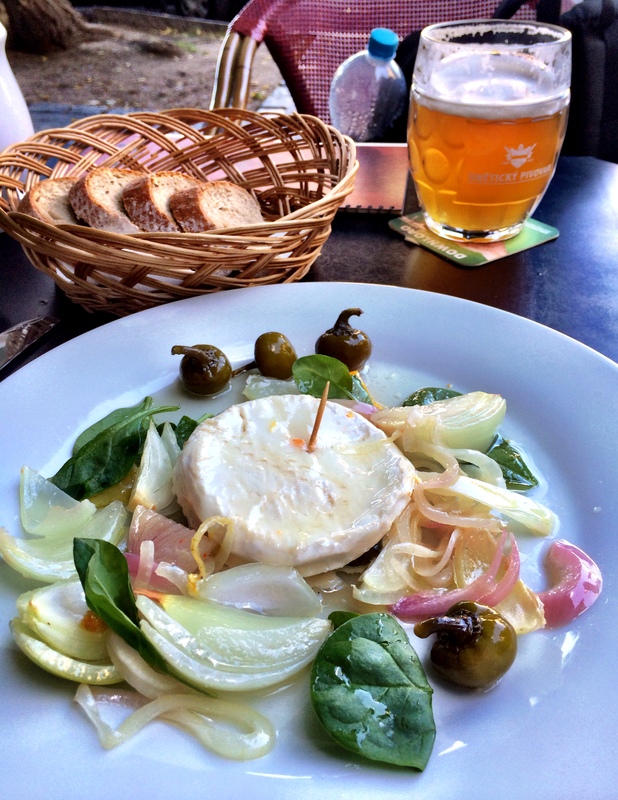 ‘The Czechs love to eat pickled camembert with their beer’ he said. ‘Come again?’ I gasped. Was he trying to tell me that the Czechs take a sacrosanct cheese and plunge it in pickling liquid and spices for an untold length of time? Did someone clear this with the French I wondered? Naturally I had to try it. And it tasted great! Thankfully vinegar is not the main player here but rather olive oil, so actually the cheese is more marinated than it is pickled. The cheese is halved horizontally and filled with sliced onion, herbs and garlic, then surrounded by more colourful accoutrements including an almost illegal amount of raw onion. The cheese softens in texture and is perfect for spreading over fresh bread. My only recommendation is that you share this dish (note to self: in the future do not order while drinking with a lactose intolerant friend! ).